I wasn’t actually sure I was going to tell you this today, because let’s face it: who really wants to tell the entire world about her failures? But as I thought about it some more, I felt like I couldn’t possibly withhold my failure from you, because then I would only be withholding from you a commonality, a shared struggle, some encouragement, maybe even some hope when you feel rejected. Because that’s how I’m feeling today: rejected. Because that’s what I’ve been today. Rejected. I discovered that my book was not chosen as a finalist in a writing contest I was confident I would do well in. Suddenly I felt like I wasted a year of my life writing a piece of junk. Really, I’ve felt rejected most of my life. I’ve rarely felt loved, good enough, smart enough, skinny enough, pretty enough, talented enough, fill in the blank. Maybe you have too. It’s better when those feelings just remain inside of you like some little nagging element that encourages you to be better. But when someone else acknowledges your failure, confirms it, rejects you. Something about the way that someone else says “you’re not good enough,” “you didn’t make the cut,” or “you didn’t get the job,” just seems to reinforce the silent nagging. Now someone else knows your secret. Now someone else knows you’ve failed. And soon the world will find out. Because if you’ve been honest with others and admitted to what your pushing toward, they will ask sooner or later. And sooner or later you’ll have to admit that you failed. Now even more people know you are a failure. Even when you’re not the one who seems to have failed, it happens. If you have kids, maybe you get that too. Or if you have a family member who continues to fail you. Sometimes someone else’s failure becomes your own. Like when your child doesn’t get tested for the gifted program again. When your kid doesn’t make the team. When someone else makes fun of your little girl’s lunch box. Or when the teacher comes down hard. It’s hard not to take it personally. Albert Einstein couldn’t speak until he was four years old, and his teachers said he would never amount to much. Marilyn Monroe’s contract with Columbia Pictures expired, because they told her she wasn’t pretty or talented enough to be an actress. So whatever it is today that you were rejected from, whatever it is that made you feel like a failure, don’t let that define your life now. Don’t allow failure to run your life. Because God doesn’t call you a failure. In fact He never once tells us we are failures. We may fail Him sometimes, but we are not failures. And if you’re working toward something your confident God has set you apart for, keep pressing forward. Just because things didn’t work out this way doesn’t mean they won’t work out another way. You can’t give up just because this didn’t work out the way you expected. Someone needs your words. Someone needs your hope. Someone needs your kindness, your talent, your encouragement, your help. God made you for something, so keep pursuing that purpose. Don’t let rejection take your purpose away from you. 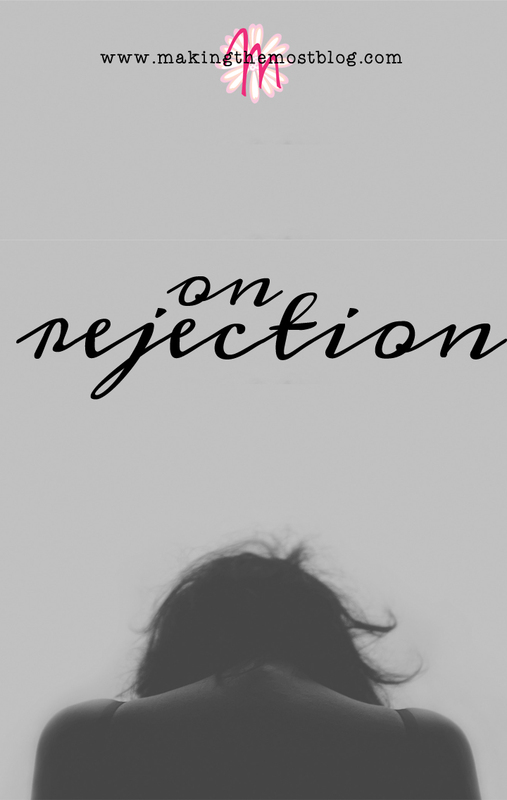 What rejection are you struggling with today? Is there some way we can pray for your situation? I’d love for you to share in the comments below.